Tonight was not a good night for the Reds. They lost 5-3 to the Mets, and Brandon Phillips was a punching bag for the baseball throughout the course of his fourth-inning at-bat against Noah Syndergaard. First, he fouled one off his left foot, then dinged the next pitch to almost exactly the same place. After collecting himself, he took a 98-mph fastball to the left ring finger. 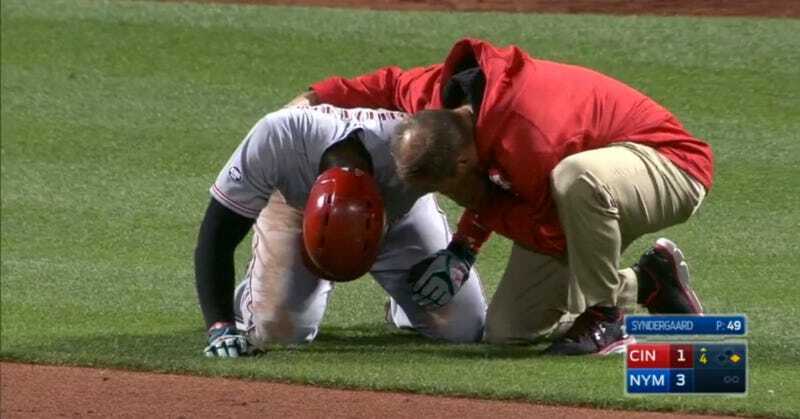 The Reds announced that X-rays on his finger injury came back negative. Given who threw the pitch, I’m glad the finger is still attached.